Charities are canceling plans for fundraising events at President Trump's Mar-a-Lago Club. The cancellations come in the wake of his controversial comments about the events in Charlottesville, Va. The cancellations come in the wake of Trump's controversial comments made earlier this week when he said that "both sides were to blame" for last weekend's deadly violence involving white supremacists in Charlottesville, Va.
Trump has been under heavy criticism all week for his remarks, which prompted many corporate leaders to bail out of White House advisory boards. So many CEOs resigned that the president responded by disbanding three committees — one focused on shaping business strategy, another on boosting manufacturing and third on improving infrastructure. After the CEOs started refusing to work with the president, pressure increased on charities to give up their annual trips to Mar-a-Lago for galas. For example, Cleveland Clinic CEO Toby Cosgrove had served on one of the disbanded business councils. And a day after that dismantling happened, the hospital announced that "after careful consideration," Cleveland Clinic would not hold its 2018 event at Mar-a-Lago. Earlier this year, despite a petition drive by doctors and medical students, the hospital had refused to cancel its fundraiser there. When medical students and other groups renewed the push recently, Cleveland Clinic remained firm, saying Mar-a-Lago met its needs. The American Red Cross said in its statement that it must provide "assistance without discrimination to all people in need, regardless of nationality, race, religious beliefs, or political opinions." The charity's connection with the president's club "has increasingly become a source of controversy and pain for many of our volunteers, employees and supporters," it said. The Salvation Army issued a similar statement, saying its event at Mar-a-Lago helped raise money for disaster victims and the homeless. "Because the conversation has shifted away from the purpose of this event," the group says, "we will not host it at Mar-a-Lago." 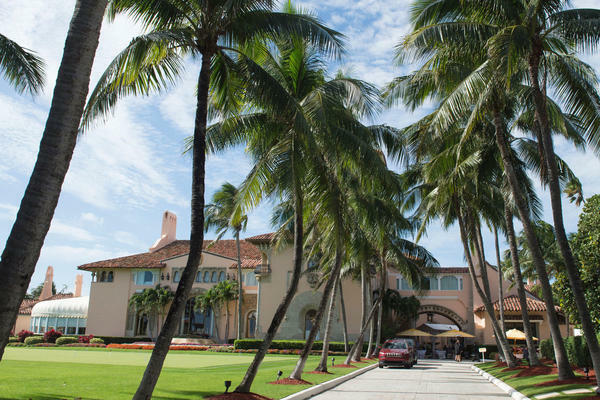 Susan G. Komen, a charity that invests in breast cancer research, confirmed it is also withdrawing from Mar-a-Lago and is seeking a new venue for its fundraising event. The rash of high-profile cancellations has created something of a scramble in Palm Beach as charities look for other suitable venues. The Palm Beach Post says other nearby hotels and the Palm Beach County Convention Center are hearing from interested groups. For Trump, the cancellations will mean a significant loss of income, unless the staff at Mar-a-Lago finds new customers who want to book a 20,000-square-foot ballroom embellished with 24-karat gold leafing, modeled, as Trump told Florida Design magazine, after Versailles.